The Easy Way: Register the new Kindle to the Same Amazon Account As the Old One. Kindle apps you've installed for any of your computers, laptops Mac, netbooks, iPhones, Android Phones and iPads. Some book publishers do however limit how many devices you can have a book downloaded to (often a maximum of 5). If you hit this limit - just delete the book from some of your devices and reload. Self-published authors typically do not limit the number of devices you can download their book to. You can do this two ways - if you bought the Kindle yourself - you can register your Kindle as you buy it - just answer yes to the "do you want to register this Kindle to your account". If you didn't do this when you bought, so you partner doesn't know months in advance what he's getting for Christmas, or if the Kindle was a gift, you just register the Kindle the first time you turn it on. After you connect to your wireless connection, or immediately if you have a Kindle with 3G, you will be prompted to enter the email and password of your Amazon account. 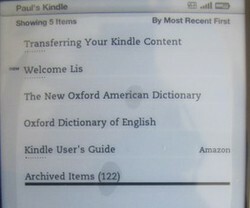 I was expecting to then have to spend a few minutes going through and downloading "his" books to the new Kindle. Nope, Kindle was ahead of me. Instead what it does - is after you've registered the Kindle to the same account as an old one: you will see an "Archived" Collection - click into that collection and you will see all the books currently bought from that Amazon account. Click through to the Archive collection - and then click on any books that you want added to your new Kindle - it will download and show up in the main "Home" page. You can then add your own collection and rearrange your books as you wish. You can even download Collections from another Kindle on the same account - if you want the same layout. Particularly for Books you Didn't buy from Amazon. The question is how to you get these books to your Kindle? Well almost certainly you already have the books downloaded to you computer - so its dead easy. Your Kindle would have come from a USB cable (or like me you have heaps of them lying around) - connect your Kindle to your PC and it will show up as just another directory (you Kindle will start charging too!). Using your computers Windows Explore or Mac equivalent - click into the documents directory on the Kindle drive - drag and drop any books you want into it.